In May of this year, Keith Collantine's F1 Fanatic asked the question Scott Speed Heading Out Of Toro Rosso?. As ever, I sprang to the American driver's defence, pointing out his improving record, particularly against his team mate, Vitantonio Liuzzi. Things have moved on a bit since then and now Sebastien Bourdais, hero of Champ Cars, has had a two-day test with the team at Spa, so it may be an opportune moment to have another look at Scott's chances of survival in F1. Accepted wisdom in the paddock is that Bourdais will replace Speed at Toro Rosso next year. This fits well with the general assessment of Speed's abilities, that he is not doing a great job at TR and is expendable therefore. But this impression is a carry-over from last year, Scott's first season in F1, when he suffered many DNFs, some resulting from his inexperience and exuberance. How easy it is to dismiss drivers in the poorer teams, assuming that others would do a better job were they given the chance. As I have pointed out many times before, Scott's record in the second half of 2006 is actually better than Liuzzi's and this has continued into this season. It is true that Liuzzi had a better qualifying record at the time of the F1 Fanatic post but that ignores those times when Scott has been powerless to do any better through mechanical breakdown or bad team strategy. Lately he has been qualifying ahead of his team mate anyway and his race performances, when reliability allows it, have been much better. Liuzzi is no slouch and still enjoys the cachet of having passed Michael Schumacher a couple of times (although this is fading from memory now), so it is significant that Speed is beating him with regularity these days. If Liuzzi is good, Speed is better, must be the inescapable conclusion. So why is Scott still disregarded, even by his team? I think the answer lies partly in his character. He comes across as light-hearted and not very serious about his job, ever ready to smile or crack a joke. For some reason, we expect F1 drivers to be more serious and grim than that. Even Gerhard Berger is clearly irritated by Scott's demeanor, forgetting that he was much the same when he was racing. A brief study of Speed's history will show that there is much more to him, his fight against ulcerative colitis, in particular, demonstrating a determination that we would not suspect from his cheerful manner. But it is history that is against Scott too. His record before F1 is neither well known nor much trumpeted. He has won his series, most notably Red Bull's search for a talented American driver, but his battle against the debilitating and incurable disease interfered with much of his progress after that. Compared with Bourdais' three Champ Car championships, with perhaps another soon to be added, Speed's record looks pretty slim indeed. As a result, Bourdais appears to be made for F1, a talent that has been overlooked in the past but is now finding its moment. It would be unkind for me to mention that previous champions from open wheel racing in the States have not fared particularly well in F1, but I will do it anyway. The proof of the pudding is in the eating and we will get our chance to see how good Bourdais is in due course, I'm sure. Looking at Bourdais' times from the Spa test, we can note that he managed to be quicker than Liuzzi. But the test was disrupted by intermittent rain and is unreliable as an indicator therefore; and that also ignores the fact that Bourdais had two days to set a decent time while Liuzzi had only one. Speed was conspicuous by his absence, of course, and I am left wondering why the team did not give him a run for a day at least, particularly in view of his latest test performances, when he has been up amongst the really quick boys. It all amounts to a team remaining blind to their best potential, ignoring a driver who is constantly improving while putting their hopes in a big reputation driver for next year. I have no doubt that Speed will be replaced next year, although he has a few races left to put in a performance that will force observers to sit up and take notice. The unreliability of the car does not bode well for him in this regard, however. But that is F1 after all. Who knows how many drivers have come and gone without really having a reasonable chance to prove their worth? I suspect that the list is long indeed. And, for the rest of this season, I will continue to root for the sole American in F1 and leap to his defence when he is unfairly criticized. Ah good on you I say, it is always frustrating to see such a talented racing driver be halted by other factors coming into play. Although if I was bosses of Torro Rosso I wouldn't like to handpick one of my inexperienced drivers from champ cars over a improving and more experienced Scot Speed. My question is why has Liuzzi been put out of the equation for being dropped? He has more experience in F1 than Speed and is still slower, so surely the spotlight should be on him rather than Speed? If I'm honest I never have been impressed much by Liuzzi, luck always comes into play but the hype about him and the actual performance was a let down for me. Personally I may replace Liuzzi with the new hotshot and at least give another year for Speed, to see him progress futher. Perhaps he might improve so much as to warrant a better drive as you seem to suggest that there is great talent in there. I know how that feels, currently supporting John Hopkins in the MotoGP series watching him on a bike that just can't give him the wins, even though Hopkins is clearly brilliant perhaps even genius level me and Mad have begun to suspect. He consistantly stays up with the top runners and out-classes his team mate, time and time again . Oh right, that's enough about MotoGP on a Forumla 1 blog for now. Well unfortunately as you say these things happen and if Speed is replaced I hope the champ car driver is as good as his reputation. That's my point exactly, Pootle - if anyone at Toro Rosso ought to be fearing for his drive next year, it should be Liuzzi, not Speed. But reputations die hard, especially when people are not watching very closely (and I admit to examining the relative performances of the two in each race very closely indeed), and it looks likely that Speed will be without a drive next year. I am slowly learning about MotoGP and the names begin to mean something. Hoppy looks to be very good, by all accounts, although I must admit to being a Ducati fan, sometimes to the exclusion of everything else (well, Kawasaki do get the occasional look in), so I'm really pleased that Casey Stoner is leading the championship so far. Give it time and you might find loads of F1 fans deserting to MotoGP - Max and Bernie are doing a very good job of ruining the show completely. What are the chances that TR was using this to directly compare Liuzzi to Bourdais? Seems like if you would want to replace a driver with another you would like to gauge both of their performances equally. Maybe Scott stands more of a chance of survival than everyone thinks! I didn't imagine I'd be saying this at the time the F1 Fanatic entry got written, but I can now see a Speed-Bourdais arrangement working. I still suspect that they will try to get Vettel to go to Red Bull a year early, but as back-up options go, retaining Speed is a good idea. Scott has experience (unlike both Sebastie/ans) of the STR set-up and can help keep the team on an even keel while STR finds out how quick Bourdais is. 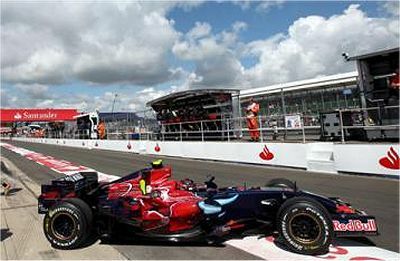 Unless Borduais is a disaster, I can't see there being a seat for Speed at STR in 2009 no matter how good he becomes - but maybe he can use next year as a stepping stone to join a faster team at last? Judging by his off-season antics with the drivers' contracts, Berger doesn't give a hoot for their feelings! He's a clever guy and has a style different from all the other F1 team bosses' so I wouldn't put anything past him. He might well have been watching Liuzzi very closely at Spa as well as Bourdais. I do think Speed has to put together some good results in what remains of the season, however. There is strong competition even for seats in a lower ranking team like STR and every driver has to deliver the goods these days. Much depends on the car, of course; if the team can make the car a bit faster (and it seems to be keeping pace with the Red Bulls) and more reliable, I am confident that Speed will score a point or two for them. That might be the make or break point as to whether he stays for 2008. If he does stay, it will be good for STR. They need to retain one driver to measure Bourdais against - two new drivers would leave the team in the same quandary it is in now: is the problem the car or the drivers? For 2009, I agree that Scott will have to look elsewhere. But that extra year would give him more of a chance to show us whether he can compete with the best. Then it will be up to him to earn a drive with another team. Well... even if he does lose his seat this year, which I hope he doesn't. You'd think one of the lower ranking teams such as say Spyker might want to grab him, to get an accurate measure of how good Albers is and to bring talent/experience to one of their drives. The problem is, there's quite a big drop between the even teams that compete for the low points to the near back of the field, to the Spykers at the bottom. Even though technically they're not far off the space, they're still quite far off. If he performs well in the end of the season I don't see too much of a reason why he can't say. Berger as you say is a sensible team leader and surely it's common sense to keep the faster driver. In the next season he as you say would probably be buying for time but I don't see if he keeps improving in that season why he can't retain a TR drive in 2009. Well, Albers is already out of the Spyker team and we wait to see who will drive alongside Sutil in the European GP. To be honest, if STR don't retain Speed next year, the likelihood is that he'll be out of a drive. There are just too many talented youngsters hanging around. I've always accepted that Scott doesn't really stand a chance of a seat in a team other than STR for the time being. To have a chance of that, he would have to do something really spectacular in the races remaining to him. And, if he did, I think Berger might hang on to him. It's a slim chance but the only one he's got, realistically. Good evening. Ask not what you can do for your country. Ask what's for lunch. I am from Guatemala and also am speaking English, please tell me right I wrote the following sentence: "Best practices for success with insurance leads." With love :-D, auto insurance leads.